The bad news is that more and more Perfect Patients clients are receiving spam to the comments section of their new blog. Even with powerful spam filters, some still makes it through. The good news is that more and more Perfect Patients clients have sites with enough traffic to attract the attention of blog spammers! 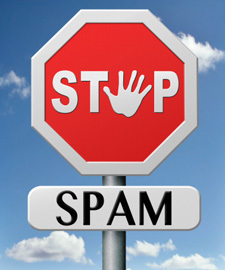 Spam, whether unwanted emails or selfish, off-topic comment spam, are simply a fact of life if you’re going to use these twenty-first century communication tools. And while our email service employs powerful spam detection algorithms to reduce incoming spam, it’s not perfect and some still gets through. Similarly, we have installed software strategies that significantly reduce blog spam. But still, some gets through. We handle the occasional blog spam old school: reading each one on your behalf and deleting them. And the good stuff? We post it to your site, moving the conversation along, engaging patients and prospective patients. All part of your Perfect Patients website service.